Build alphabet awareness and letter recognition skills with this fun matching game! Put the acorns together by matching upper- and lowercase letters, and look inside for a surprise. Find a color-coded counter in each acorn that corresponds to the letter. Stack to build simple words, the ABCs, or use for simple matching play. 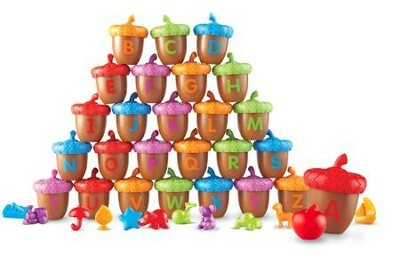 Includes 26 two-piece acorns and 26 color-coded counters to match each letter. Acorns measure 2"L x 2.5"H.
I'm the author/artist and I want to review Alphabet Acorns Activity Set, 78 Pieces.